I’ll be honest and say that I’m avoiding The Dark Knight until the crowds die down a little and the creepy-morbid fascination with Heath Ledger is older news. I think the attention paid to his acting is warranted; I thought (and still think) that Ledger was a phenomenal actor getting better by the day. He should be mourned, absolutely. By family, friends, fans, an entire industry, Brooklyn. But I don’t like gawkers. I can’t get behind the kind of post-tragedy, upside down version of fairweather fandom that leads to his action figures from TDK selling like hotcakes on eBay or theaters flooding with newly declared fans itching to get in on his final performance. I fully believe the movie is amazing, I believe most people who went to see it were genuine, and I fully intend to see it myself. But hopefully without the feeling that I’m swept up in a crowd rubbernecking at a bad accident. So because of this, I missed seeing the premiere of the trailer for Watchmen that played with TDK. I heard about it thanks to Pop Goes the Library’s excellent post on superheroes in the “real” world. 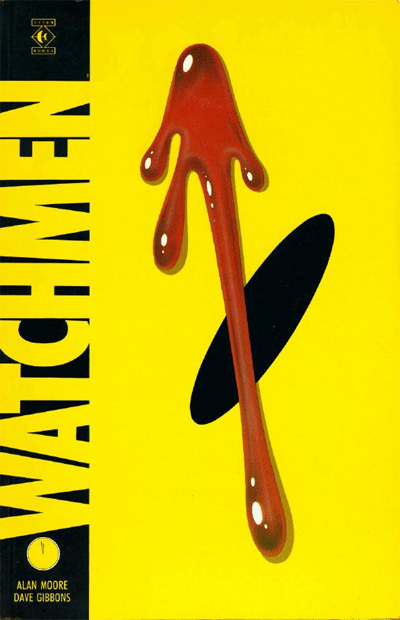 I have not read Watchmen, and I fully admit that here I am jumping on the bandwagon. I snatched up my branch’s copy of it today when I saw that it was starting to fly off the shelves following the trailer’s release. In the time it took me to get it off the shelf, someone had already put it on hold. Did I do the chivalrous librarian thing and turn it over to the quick patron? You bet your sweet bippy I didn’t. Patron wasn’t quick enough, and now I have it in my possession. I am once again late to the party, but I haven’t missed it entirely. When the movie comes out in March I will be ready.